Why doesn’t Cathy Garcia-Molina want LizQuen to become ‘official’? Liza Soberano says her father almost chastised her after hearing rumors that she and Enrique Gil are now a couple. Blockbuster director Cathy Garcia-Molina is not entirely ecstatic at the prospect of love team Liza Soberano and Enrique Gil taking things from reel to real. According to Direk Cathy things get “complicated” once actors start mixing their personal feelings into the craft. “Ako ayoko! Ayoko! Iki-no-complicate ng relationship and every love team. I’d rather work with love teams that are not together in real life,” she stressed during the story conference of her upcoming film with LizQuen. The burden of having real life lovers on the set is that they tend to carry the “emotion” that they have at that moment oncam. “Kapag nag-away ‘yan eh di away rin sa set ko paano ‘yan?” she mused. “I’ve been with love teams that were in a relationship and trust me it’s not easy,” she declared. 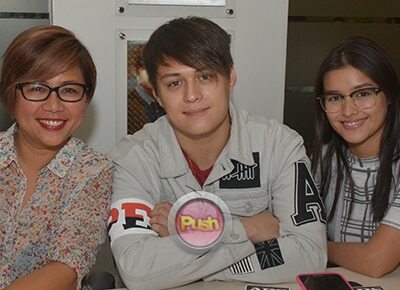 So, selfish as it sounds, Direk Cathy suggests to LizQuen to “wait” a little longer. For his part, Enrique explained that he and Liza are still enjoying each other’s company and that they are in no rush to make things official. “Label is just a label,” he said. Questions about the real score between them was spurred by the recent statement of Liza’s manager Ogie Diaz, who surmised that LizQuen are now together but are only “hiding” their relationship from the public.